Abou Diaby has signed a new long-term contract extension at Arsenal. The 23-year-old France international midfielder, who signed a contract to the end of 2012 in January 2008, has made 117 appearances for the Gunners. Diaby said: "This shows my long-term commitment to Arsenal and I am very happy here." Gunners boss Arsene Wenger said: "Abou has a huge presence on the pitch and has the potential to be an influential part of Arsenal for many years." 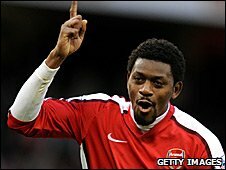 Diaby, who joined the Gunners from Auxerre in January 2006, added: "I am so pleased to extend my contract. "It's a great thing for me and hopefully there will be some good years ahead for me here." Meanwhile, Arsenal midfielder Henri Lansbury, who is on loan at Watford, has signed a new long-term contract with the Gunners. Lansbury will also stay at Vicarage Road until the end of the season.